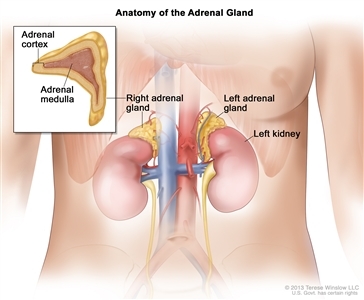 to nearby tissues, but not to the organs near the adrenal gland. to other parts of the body, such as the liver or lung. This summary section describes treatments that are being studied in clinical trials. It may not mention every new treatment being studied. Information about clinical trials is available from the NCI Web site. Check the list of NCI-supported cancer clinical trials that are now accepting patients with stage I adrenocortical carcinoma. For more specific results, refine the search by using other search features, such as the location of the trial, the type of treatment, or the name of the drug. Talk with your doctor about clinical trials that may be right for you. General information about clinical trials is available from the NCI website. Check the list of NCI-supported cancer clinical trials that are now accepting patients with stage II adrenocortical carcinoma. For more specific results, refine the search by using other search features, such as the location of the trial, the type of treatment, or the name of the drug. Talk with your doctor about clinical trials that may be right for you. General information about clinical trials is available from the NCI website. Check the list of NCI-supported cancer clinical trials that are now accepting patients with stage III adrenocortical carcinoma. For more specific results, refine the search by using other search features, such as the location of the trial, the type of treatment, or the name of the drug. Talk with your doctor about clinical trials that may be right for you. General information about clinical trials is available from the NCI website. Check the list of NCI-supported cancer clinical trials that are now accepting patients with stage IV adrenocortical carcinoma. For more specific results, refine the search by using other search features, such as the location of the trial, the type of treatment, or the name of the drug. Talk with your doctor about clinical trials that may be right for you. General information about clinical trials is available from the NCI website. Check the list of NCI-supported cancer clinical trials that are now accepting patients with recurrent adrenocortical carcinoma. For more specific results, refine the search by using other search features, such as the location of the trial, the type of treatment, or the name of the drug. Talk with your doctor about clinical trials that may be right for you. General information about clinical trials is available from the NCI website.